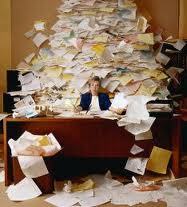 Is it true that a cluttered desk is the sign of a cluttered mind? Can you think better in this office? The contrast is a stark one; I chose those two images to make a point: When our lives are cluttered, (even if it isn’t as bad as the first picture) our brains can’t think clearly. According to our Get Your Guest MOJO! Guest Blogger, Regina Lark, Ph.D., founder and CEO of A Clear Path, a Los Angeles-based professional organizing business, excess clutter causes our brains to come to a screeching halt. My Possibility Agents associate, Ingrid Sarrat, wrote movingly about her own process “Letting Go” of life’s accumulations on her blog. She shares how hard it was, but so worth it. You don’t have to be a candidate for the Hoarding: Buried Alive show to recognize that you would benefit from getting more organized. But knowing it and doing it are two different stories. According to Regina, a typical response to too much clutter is that we feel immobilized. 1. Quiet the mind and take a deep breath. Accept the situation as it is. It is what it is right now. And it is about to change. 2. Understand these concepts: a) You are not your clutter. b) You are not lazy. 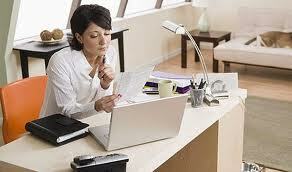 c) Clearing clutter means that you have to make regular dates with yourself to get the work done. 3. We tend to look at the clutter as a monolithic whole. But it’s easier to manage by looking at it in smaller chunks. So… make a list of each cluttered area in your life (be it physical or emotional) as it relates to feeling stuck. Make the list specific: what’s the clutter look or feel like? how long have you had it? 4. We need to acquire knowledge about where we are at right now to make sense of how to work out of it. Drill down some more: How do you believe the clutter prevents you from creating or reaching a goal? How does the clutter make you feel stuck? 5. When have you tried to de-clutter? What time of day? How much time did you give to the task? Write about how you have tackled the problem in the past – what worked and what didn’t? Do you keep trying to de-clutter the same way expecting different results? 6. Re-define for yourself the words “failure” and “success.” I grew up with ideas about the definitions of success and failure. About a year after I started my professional organizing business I experienced months where growth was slow or felt non-existent. Instead of feeling like a failure I decided to re-evaluate what it meant to be a success. And so I decided that for me, a successful month for A Clear Path is the month I don’t have to borrow from my dad. So far, I haven’t had to borrow any money from my dad. See what I mean? 7. Clutter has a way of muffling sound, it takes up the air, left alone long enough it’ll take on a musty odor. Spend quite time creating a vision in your mind (or cut from pictures and taped to a poster board) of what your ideally cleared spaces will look like, smell like, feel like, sound like. 8. Think of tackling the clutter strategically. For every hour you take to de-clutter, you need an hour to reintegrate the stuff you intend to keep. Look at the list of your cluttered areas and figure roughly how much time you’ll need for each project. Once you start the process, you’ll know soon enough if you’re in the ballpark. 9. Get your calendar and start making dates with yourself to clear the clutter. This is really important. Commit. Commit. Commit. Look at the big picture; be realistic. Do you have a lot of time off in the summer? Are you able to devote 2 hours every Saturday? Once a month? When do you feel most “up?” Are you a morning or night person? Schedule the sessions to give yourself every advantage. 10. Habits: To keep the clutter away you may have to change a few habits. If you habitually drop your clothes on the floor at the end of the day, you may want to change how (or where) you change into your pajamas. You may have piles of mail that’s easily identified as trash for recycling. Think about sorting mail near the recycle bin before you even bring it into the space. If mail is dropped through a slot, sort it on your way to the household recycle container. What areas of your life would you like to streamline? Which of Regina’s tips are you going to try? I hope you will share your comment luv and if you have a friend or colleague who looks clutter-stuck that you will send them this blog link! Dr. Lynn K. Jones is a Board Certified Coach and an Advanced Certified Personal and Executive Coach based in Santa Barbara, California. She is a sought after coach and consultant for organizations and individuals across the US. Her doctoral work completed at the Wurzweiler School of Social Work, Yeshiva University concerned organizational culture; she coaches, consults and trains organizations on what they need to do to create organizational cultures that are aligned with their vision and values using a process of Appreciative Inquiry. She coaches individuals on achieving their reflected best selves. A MSW@USC faculty member, Dr. Lynn K. Jones, MSW, DSW, CSWM, teaches Human Behavior and Social Environment and Leadership to social work students at the University of Southern California. I am in the midst of working with a professional organizing right now. We tackled the core areas and now I’m scheduling uncluttering time to finish the job. Ditto to everything Regina said. That is awesome, Christina! What was the best outcome for you of getting organized? I had help de-cluttering my closet and clothes. It made me feel like I’d lost weight. My look greatly improved when I could confront my clothes and feel good about them. When I help a client go through their jewelry, repair this, polish that, sell that for gold credit, re-design this to be up to date or honor that ancestor, the final result is more jewelry love and more joy in going to the jewelry box. Thanks for this post Dr. Jones. Both such good examples, Calla of how getting unstuck from clutter has such a tangible impact on how we feel and think about things. This blog speaks to all of us! I especially liked tip #6 which is to clearly define (or redefine) success. It helped me surface my own expectations of myself. It made me realize I was comparing my desired end result to a perfect magazine photo spread. I also was picturing a retired friend’s household that does not include a messy teenage boy, a dog, and who has lots more help. So thanks for taking some of that pressure off! I’d rather keep the teenager and the dog and make incremental progress. Thanks for commenting, Nancy! Isn’t it interesting how many of our mental images are picture perfect, but totally unreasonable when we take the time to examine them. I had a friend who had a minimalist house. I mean REALLY minimal. I felt so good in her house and wished my house could be like that. When I tell my friends that I would like to just get rid of all the dust catchers and nick nack-they all say “but it’s so charming and fun to look at”. I feel it’s a burden. Keeping all those items clean is a job I’d rather not do. I live in a mountain cabin and the nick nacks are charming. I’d love to have a modern house, with clean lines, devoid of clutter. I feel I could think better in a house like that.In my dreams! !